Hey bidder, hey bidder, hey bidder! Major League Baseball’s All-Star Game is tonight in Cincinnati. While we at Americana Journal aren’t big fans of baseball (no offense to those of you who are), we are huge fans of folk art. One incredible piece of baseball-related folk art sold quietly at auction earlier this year, with no media coverage. But, we have the story. From 1871, a presentation bat in original red, white and blue paint with a black handle and gold bands, 54 inches long, brought $9,680 (with buyer’s premium) during a sports memorabilia auction held by Forsythes’ Auctions in Cincinnati on January 31. The bat had a central design lettered “J. 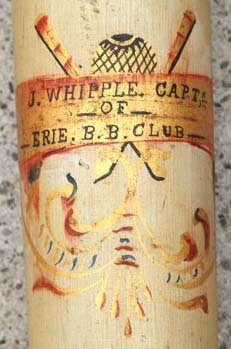 Whipple, Captn, of Erie. B.B. Club.” The hand-painted motif included a baseball, crossed bats, a cap and a horseshoe. It was also dated 1871. “It’s probably one of the finest folk art bats to be sold,” said auctioneer Dave Forsythe. The bat was found at an estate sale “somewhere in Pennsylvania or somewhere,” according to Forsythe. The where didn’t really matter. The why was obvious. Although baseball’s roots can be traced to a game played in the United States in the 18th century, the sport as we recognize it today truly came into form with semi-pro national baseball clubs in the 1860s. The presentation bat sold by Forsythes’ Auctions dates to when organized baseball was still a toddler in diapers. What boosted the bat from great to spectacular was the condition, described as “amazing” by Forsythe. “I would grade it a 10, and I don’t grade many things a 10,” he said. Forsythe had little success in tracking down information about Captain Whipple. “I tried to do some research on who it was presented to,” he said. Other than Erie, Pennsylvania, there was a connection to Baltimore, but little else. Provenance or not, there was no denying this was a great bat worthy of a prime spot in someone’s collection. Simply put, it’s an All-Star.